If you are looking for information on the Snappy Auctions franchise business opportunity, Snappy Auctions franchises or Snappy Auctions franchising, then you have come to the right place. Snappy Auctions -- the leading eBay drop-off franchise! Rated one of the hottest franchise concepts for 2005! Snappy Auctions is one of the most ingenious concepts in franchise history. You have heard the excitement about eBay- now you have the opportunity to own a franchise that brings the power of eBay and online auctions to everyone. Snappy Auctions is the leading eBay Drop Off store franchise; customers bring in items to your store that they would like to sell on eBay, and Snappy Auctions takes care of all of the work then sends the customer a check. Simple! There is a huge population of people who don't have the time or desire to figure out how to sell things, so they just bring their things to Snappy Auctions. Now, people don't have to have garage sales or use local classified ads. They can just drop things off and Snappy Auctions will do the rest. A recent Neilsen survey indicated that the average household has over $2,200 worth of sellable goods! What a market! 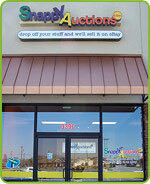 Snappy Auctions is committed to quality, to our end customer and equally to our franchise partners. When you meet our team, you will see how our franchisees love what they do! We are committed to helping our franchise partners thrive as entrepreneurs.